In 1993, a beautiful Kali image brought from India was ritually awakened by Sri Haradhan Chakraborty, the late main priest of the Dakshineswar Kali temple. He named her Sri Ma Dakshineswari Kali. Devotees who had very little background in the intricacies of India’s temple puja standards gradually adopted this vastly rich devotional tradition one detail at a time—out of a simple love and desire to please Mother. This simple daily worship grew organically into present-day Kali Mandir, where devotees can pour forth their hearts’ yearning to the Great Mystery at the center of existence. 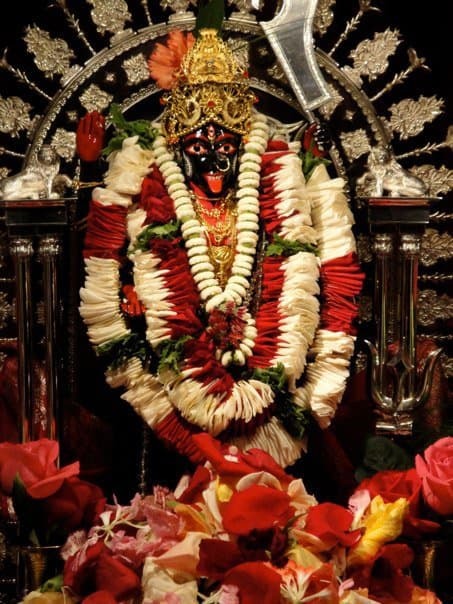 Founded in 1993 by Elizabeth Usha Harding, author of Kali, The Black Goddess of Dakshineswar, Kali Mandir has grown into a beautiful blend of sincere Indian and Western devotees from different lineages, as well as aspirants with no formal affiliations. Kali Mandir was formally registered as a California non-profit, tax-exempt religious organization in 1995. 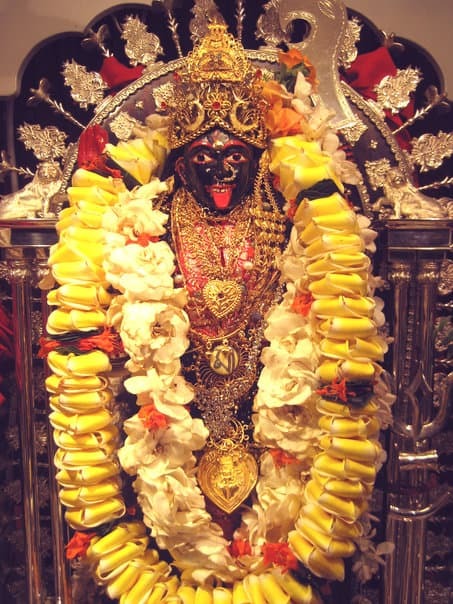 Kali Mandir is closely associated with the Dakshineswar Kali Temple, located in Kolkata, India. Founded in 1855 by a courageous woman named Rani Rasmani, Dakshineswar became world famous as the stage for Sri Ramakrishna’s Divine Play. This temple is also associated with the lives of many great saints such as Swami Vivekananda, Paramahansa Yogananda, Sri Anandamayi Ma, Swami Ramdas and Neem Karoli Baba. Today millions of devotees from all over the world come to Dakshineswar throughout the year to worship the Divine Mother as Ma Bhavatarini Kali (Savior of the Universe). Sri Haradhan Chakraborti and Sri Pranab Ghosal, Dakshineswar temple priests, brought a beautiful stone image of Kali from India. The Kali image was ritually awakened in Laguna Beach in 1993 and given the name Ma Dakshineswari Kali (the Goddess from Dakshineswar). Since that day, Ma has been formally worshiped at Kali Mandir during daily pujas, monthly amavasyas (New Moon worship) and yearly festivals. She is worshiped along with other forms of divinity such as Lord Ganesha, Shiva, Vishnu, Radha & Krishna, Hanuman, and Ma Durga. Kali Mandir aims to create a tangible spiritual atmosphere through daily worship, ritual, singing, chanting, volunteer service, reading of the scriptures and spiritual discussions. Open to all religious denominations, Kali Mandir functions as a traditional Hindu temple dedicated to the worship of the Divine Mother Kali in the mother/child relationship. The mode of worship is conducted in a similar manner as that of the Dakshineswar Kali Temple (with the exception that we are strictly vegetarian). We implicitly follow the spiritual tradition of Sri Ramakrishna, Holy Mother Sri Sarada Devi and Swami Vivekananda. Kali Mandir stands for universal spirituality. No practices associated with a sectarian cult or left-handed forms of Tantra are performed here. Worship is done in accordance with dakshina-marg or the right-handed path of Tantra which adheres to conservative Hindu norms in the mood of selfless devotion. While devotees may have their individual gurus, there is no guru or personality cult at Kali Mandir.Our spiritual focus is on the awakened deity Ma Dakshineswari Kali and Sri Ramakrishna. Promoting traditional Goddess worship, Kali Mandir aims to remove misconceptions about such worship.We propagate a spiritual culture that forms a bridge between East and West. Kali Mandir strives to be a place where people are inspired to lead ideal lives of love and service. As a purely spiritual organization Kali Mandir has no affiliation with any political organizations anywhere in the world. Kali Mandir has no membership and is financially supported by voluntary donations. A small portion of income is derived from our gift shop named Ancient Mother.